All of our jewelry items are custom and handmade locally in the USA. We leverage a combination of the latest advancements in 3D imaging while also employing the traditional jewelry making method of lost wax casting. When you place an order, within 1-2 business days for processing, an exact wax replica of your jewelry piece is created for casting. During casting, our jewelers hand pour molten silver or gold for your piece and let cool. When ready, your piece is polished to perfection. Our master jeweler has over 20 years of finishing experience. It usually takes about 5-7 business days from start to finish. What if I order a Custom Paw jewelry piece? Custom Paw pieces with your pet's actual paw print require an additional 5 business due to additional design time. For more details, please check out our Custom Paw-cess. 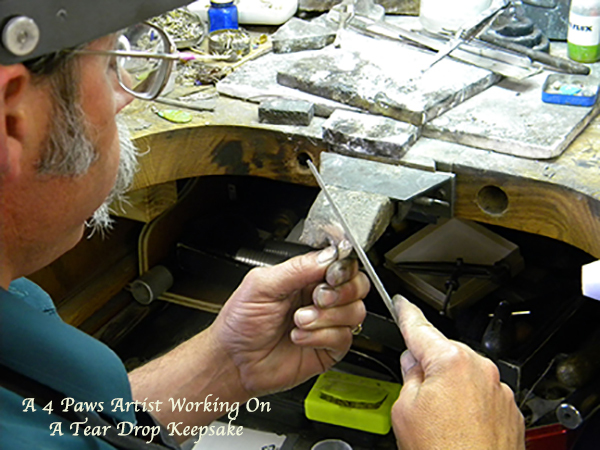 We love what we do and work hard to ensure that you will absolutely love your custom 4 Paws Forever jewelry piece too! For any questions, please contact us.